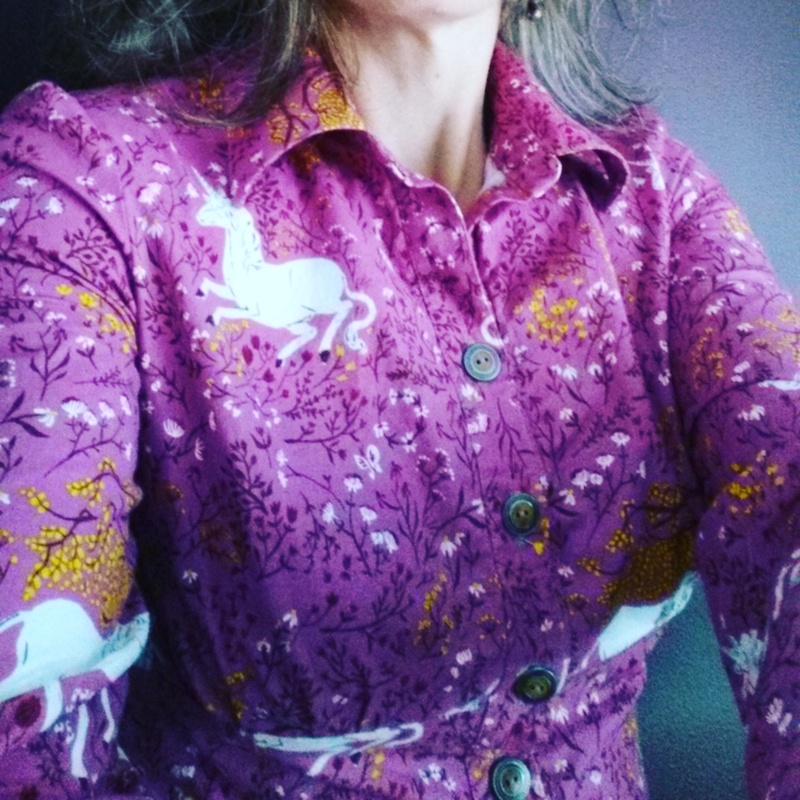 Following on the footsteps of my previous post, is the second half of a challenge to sew with swapped fabrics sent from my friend, Maja. She had purchased a scrap bag that contained a variety of Bonnie & Camille fabric scrappy cuts and she spilt it with me. Then we challenged each other to make whatever we wanted with those scraps and to share a finished project before the end of 2017! 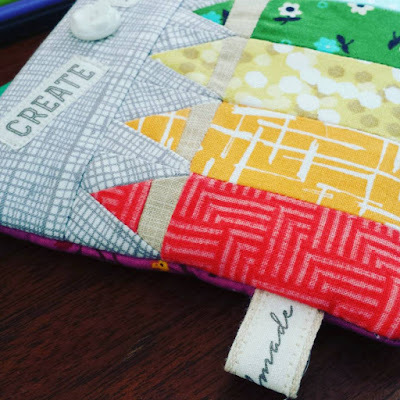 Sewing with scraps is something I really enjoy - however the challenge for me in this swap was to come up with a way to use them in a more "controlled" scrappy design. Mini Nines to the rescue! This is a fun block to make with scraps and the pattern can be found in Amanda Jean Nyberg's book, No Scrap Left Behind. Working with the scrap strips and pieces that Maja sent, I added in a few pieces from my scrap stash to complete the nine patch blocks - there wasn't enough in the swapped scraps for me to completely frame a nine patch, so I improvised! 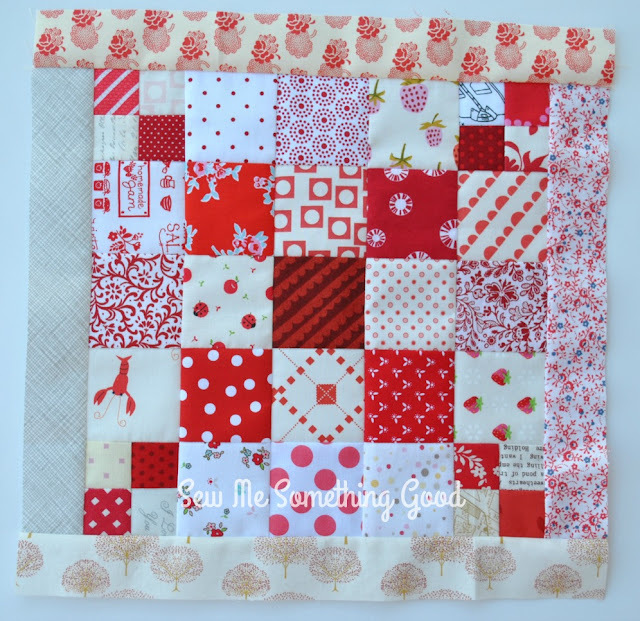 This sweet table runner is backed in a solid red that shows my loopy free motion quilting and then I bound it in a Bonnie & Camille fabric from my stash. Once all the blocks were made and laid out, I decided to add more scraps to frame the ends (and add a little extra length to the table runner). It was a fun challenge and a happy finish! 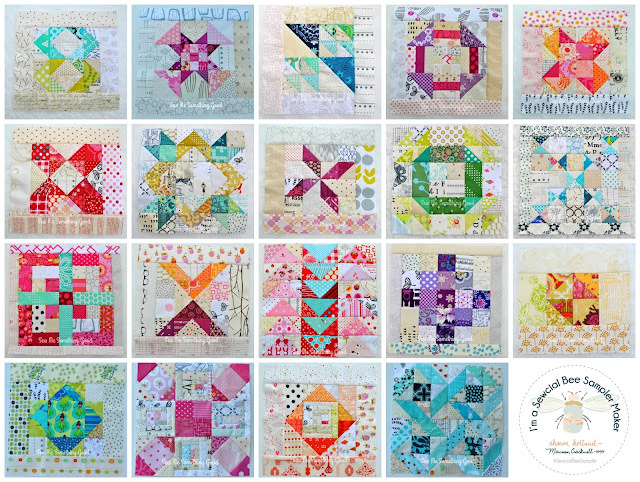 Linking up my happy little finish with Amanda Jean and friends, at Crazy Mom Quilts, for Finish it up Friday! Bountiful is the word that seems to sum up my year! Many wonderful opportunities and adventures made up my 2017. 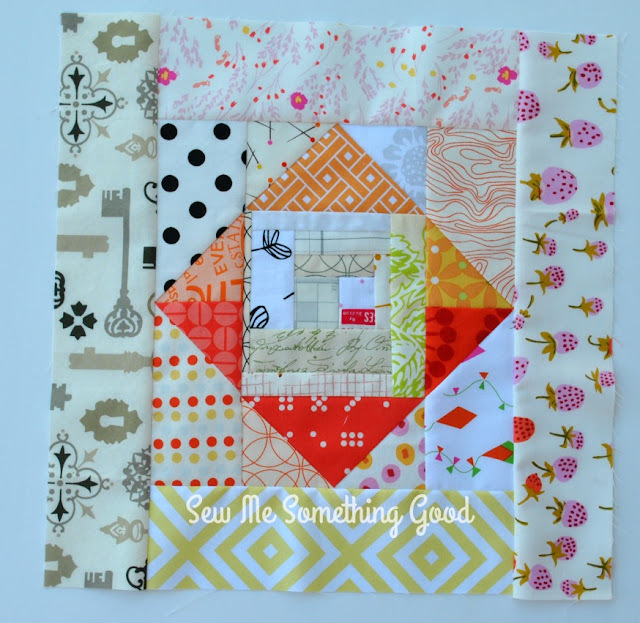 The Sewcial Bee Sampler was one such opportunity and it also was a wonderful adventure! This virtual quilting sewalong was comprised of twenty five quilt blocks which were shared over the course of 25 weeks, for anyone willing to participate, to sew. This fun event was hosted by two lovely designers, Sharon Holland and Maureen Cracknell. The community of quilters sharing their makes on Instagram while cheering each other on, made for a lively and delightful experience, I was glad to be a part of. If that wasn't enough - we also had weekly giveaways to enter from several generous sponsors. I happened to be among the prize winners over the course of the sewalong, when I won a pretty fat quarter bundle of ten fabrics from Sharon Holland's Bountiful fabric line, supplied by Brooke from Ladybelle Fabric. Ten fat quarters of Bountiful designed by Sharon Holland for Art Gallery Fabrics, which I won from Ladybelle Fabric this past summer. I decided to split my winnings with my friend, Maja, and we came up with the idea that each could make whatever she wanted using Bountiful and keep it a surprise until the end of the year. Today's the day to share! All ten Bountiful fabrics were used in my project - combined with several other designers prints. 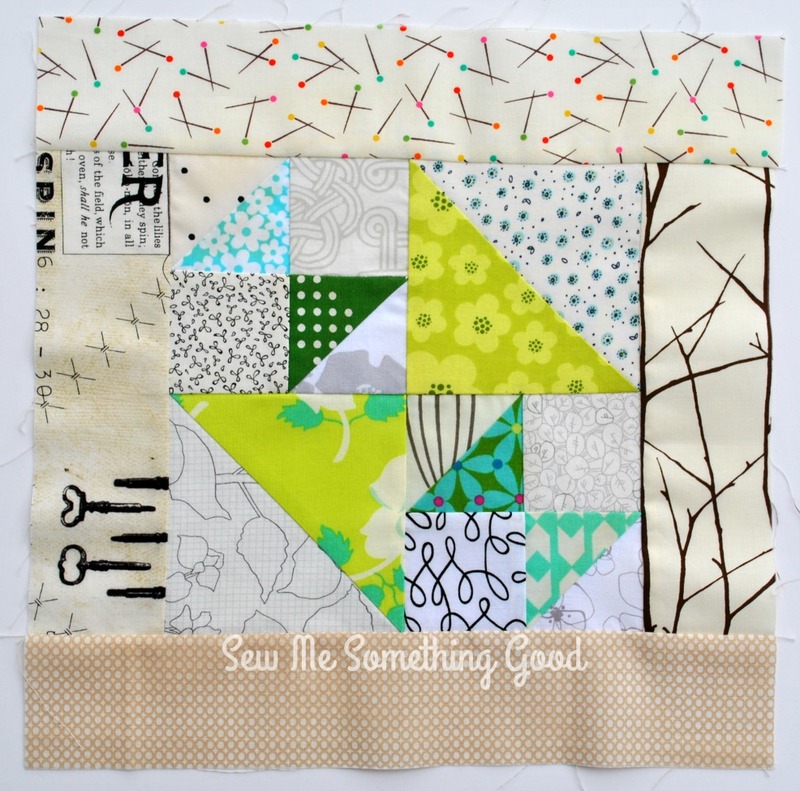 I fell in love with sewing flying geese blocks during the sewalong and even though I sketched several other ideas for using my share of the Bountiful fabrics, this simple one won my heart. I sewed nine flying geese blocks, paying attention to colour placement and arranged them to all point in one direction, bordering them with natural coloured linen. A simplistic design that lets the fabrics be the stars! 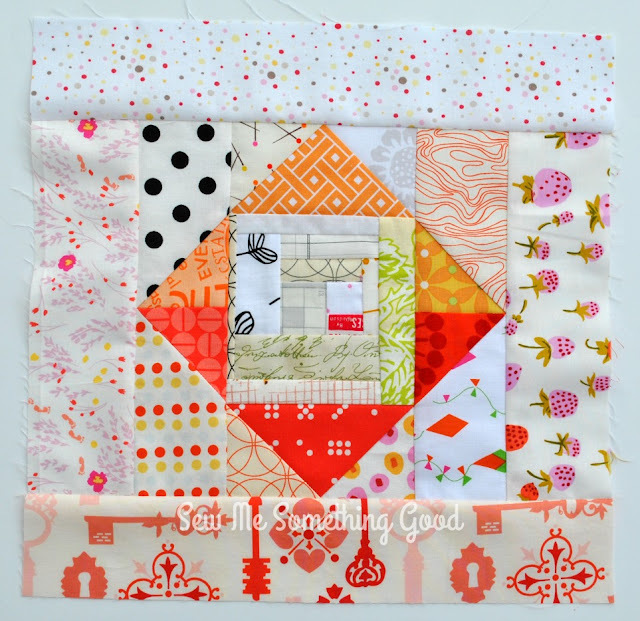 Long wavy lines of quilting, in Aurifil 50 weight (#2420) in a soft peach, happened to be the perfect complement and can be found in Maureen Cracknell's Bohemian Garden thread collection. The back of the table runner is a combination of two fabrics from my stash that are from the same collection as the blue houndstooth print used for the binding. If you are at all familiar with my sewing style, you will know that this is not my usual colour palette, but I couldn't be happier with my table runner made from Bountiful fabrics! I really wanted to do justice to the quiet beauty of Sharon's fabrics, so I am glad I took some time to work out a design that would let them shine! A cute pattern deserves to be made more than once, right? 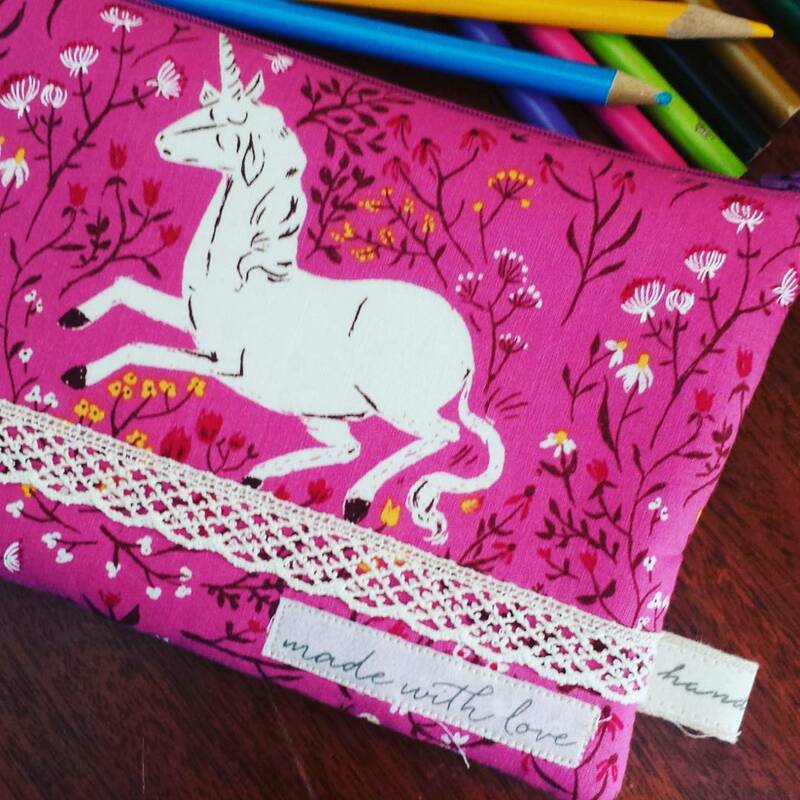 My second version of the Noodlehead pattern, the Rainbow Clutch, by the talented Anna Graham, is also a gift (pattern found in Handmade Style: 23 Must-Have Basics to Stitch, Use, and Wear). This time around, I selected scraps of quilting cottons to make the front pocket pieced (following the pattern's design) rather than in one fabric like I did in my first version. Once again, I fussy cut the fabric selected for the front tab - which is one of my favourite design features in this pattern. Can I just say how much I love the casual, yet stylish look mixing these blues with denim gives this clutch? I am hoping that the mama of four that received this clutch finds it to be everyday useful made in this combination of fabrics. I thought the choice of using denim for the main body of the clutch would make it wear well and design features such as the exterior inset zippered pocket make it very practical. This fall, I finally had the pleasure of sewing my first Noodlehead pattern by the talented Anna Graham. I decided I would make a version of her Rainbow Clutch as a gift for a friend, from her lovely book Handmade Style: 23 Must-Have Basics to Stitch, Use, and Wear. It's a fun design and I was delighted that I was able to fussy cut some long hoarded Joel Dewberry fabrics (which I featured on the flap and front pocket) to make my version a extra special for the recipient. The pocket is pieced on the original design - but I think choosing a treasured fabric to make it in one piece is a great option! The fabric I used for the all the exterior pieces is a decorator weight, which worked beautifully to give the clutch a crisp shape. It did make it a little more challenging in terms of bulk, due to the darts that form the curved shaped, but I made sure to stagger rather than stack the direction of them when pressing and stitching. 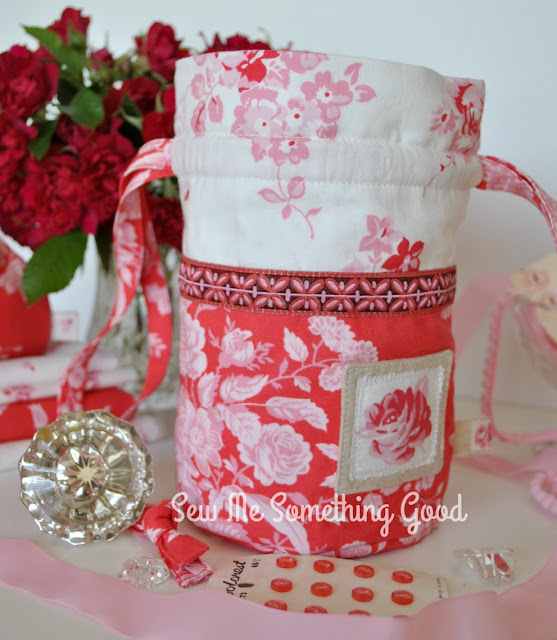 I wanted to play up the hot pink accents on the front pocket, so I selected a quilting cotton in the same colour for the lining of the back inset pocket and for the lining of the clutch. I love that pop of pink when you open up the zippers! Sometimes what you have been looking for is right in front of you! This fall, I was invited to stop by an impromptu garage sale hosted by my lovely friend, Heather and in conversation with her, an idea was sparked and a dream rekindled. Years ago, while busy raising our families, we would talk enthusiastically about our love of vintage and thrift store shopping, even daydreaming a bit about how fun it would be to have a shop selling such treasures. Time flies! Here we are at the end of the week and at the end of September, already. Wow. Somehow, I lost track of time and the rhythm of blogging without meaning to. Let's jump back in and share my latest happy little project! 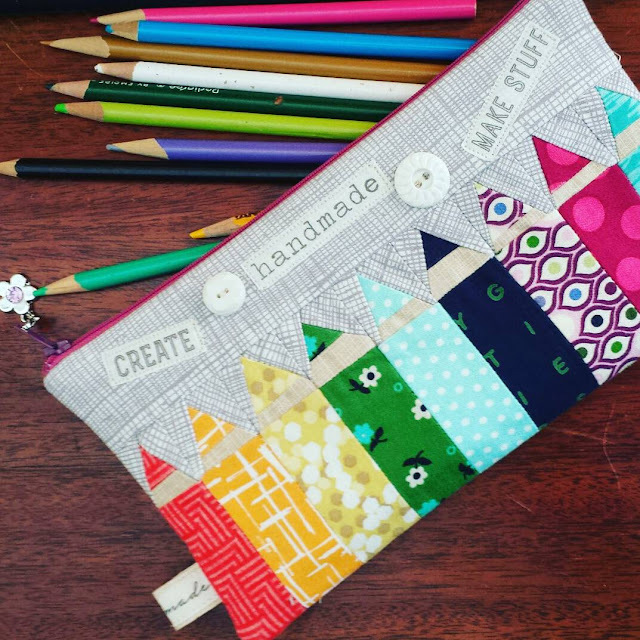 The pattern for this colourful case can be found in the book, Sew Gifts and is the design of Adrienne Smitke. I decided to make her version in a rainbow of pretty fabrics and to play up the variance in the tips of the improv pieced pencils. Then I tweaked the original pattern by enlarging the strip of fabric above the pencils in order to give her extra room for storage and to allow me the opportunity for some embellishing! Fussy cuts from a text fabric were the basis for making several "tags" to decorate the front, back and even a piece of plain twill tape (that I inserted into a side seam). 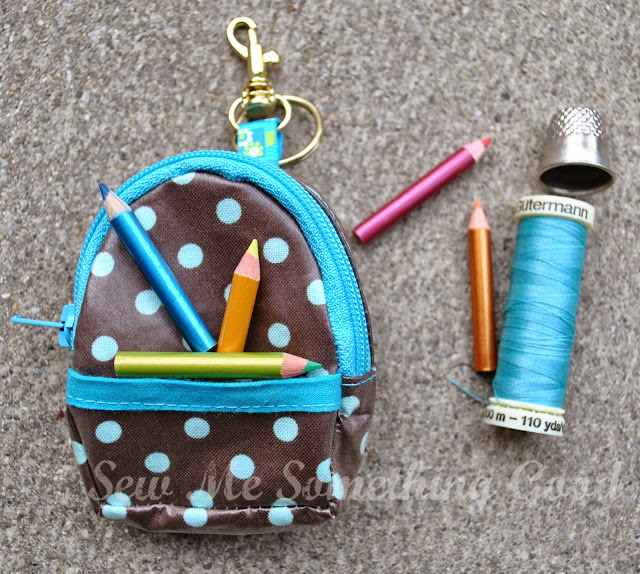 This niece likes a bit of "bling" so a sparkly charm added to the zipper pull should satisfy that desire! A dark text fabric seemed the perfect choice for the lining of the pencil case as it shouldn't show any stray pen marks so easily. Have you heard? Rachel at Stitched in Color is hosting another of her fabulous fabric mosaic contests, called Summer Crush. You can make up to two mosaics (enter by Aug. 20th)! Then on Monday the 21st, voting will open. The two top Mosaics will earn a complete fat quarter set of their mosaic fabrics from the sponsor of the contest, Quilt Sandwich Fabrics !!! Winners announced August 24th. Summer can be such a busy season and it seems to pass in the blink of an eye... or maybe that's just me getting older! ;o) This summer has been a rich one - I've been gardening, canning, taking in favourite outdoor summer activities, travelling, exploring, spending time with family and squeezing in some sewing time (mostly garment making - which has been so lovely to return to!). It has been wonderful! One activity I enjoy year round is fabric play, so it only made sense to take a favourite past time and put together a mosaic for the Summer Crush fabric mosaic contest. So what are you waiting for? 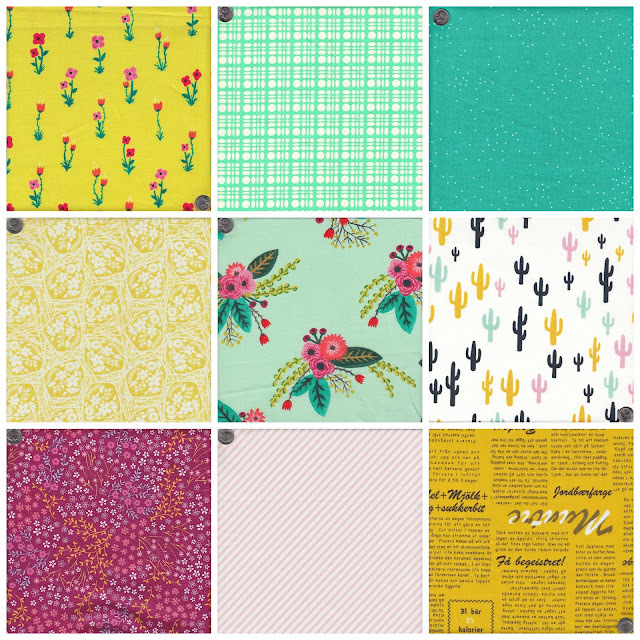 Let's make the summer fun last a bit longer by popping by Quilt Sandwich Fabrics, selecting fabrics that say summer and put together a mosaic to enter in the contest, Summer Crush at Stitched in Color! 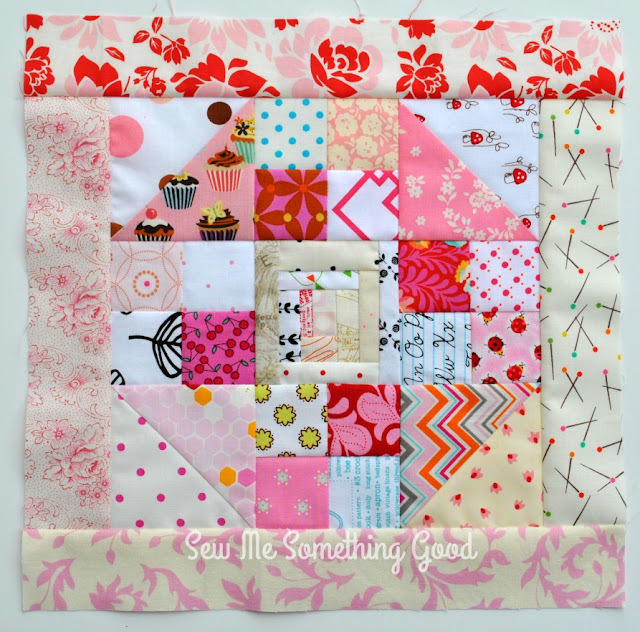 This is the last block in the Sewcial Bee Sampler (a fun online sew along), hosted by Sharon Holland and Maureen Cracknell! The block for this week is Prairie Queen (for the free download to make this or the previous blocks, visit Maureen's or Sharon's blog). Although all the blocks are now finished, the sew along is not over with just yet! Sharon and Maureen will continue to guide us through the completion of our quilts. 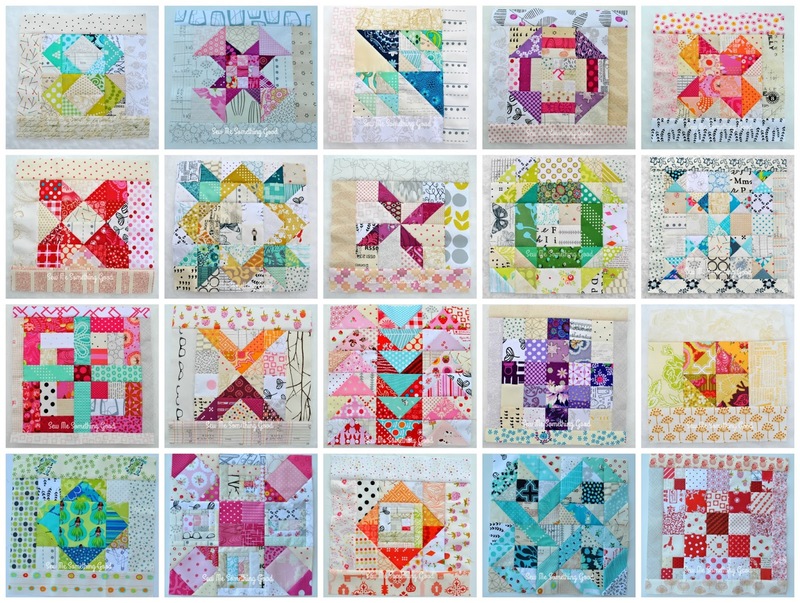 I'm looking forward to not only turning my blocks into a quilt, but also seeing all the other participants' quilts made from the SBS blocks. I really can't believe how quickly the weeks passed and how much I anticipated the release of each week's block! 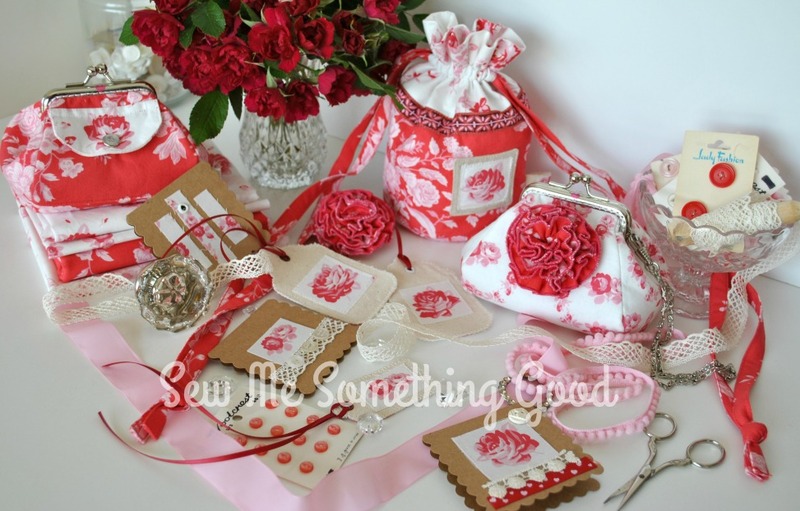 What a wonderful sew along that I am happy to have joined! This is the second to the last block in the Sewcial Bee Sampler (a fun online sew along), hosted by Sharon Holland and Maureen Cracknell! The block for this week is Crosses and Losses (for the free download to make this or the previous blocks, visit Maureen's or Sharon's blog). Only one more block left in the sew along! The weeks have passed more quickly, I think, with a new block to look forward to and I can hardly believe that we are nearing the end. Summer here has been one for the record books with it's string of hot, dry days. Ironic, after the record breaking flooding we had this Spring. Sadly, this also means that we are now dealing with wildfires across the province. I love the wild beauty of this province, and it's always sobering to realize the danger that exists when a combination of factors (such as extreme heat and a random spark - via Nature or mankind) come together. Thankfully, at this point,we only have poor air quality locally, which is due to the smoke from the various fires. However, it is a very real reminder of the wildfire experience we lived through in 2003, when we were among those evacuated from our (then) home. We were among the lucky to have a home to return to, while homes within a kilometre of ours were destroyed. I feel for all those with homes, businesses and lives being changed by the wildfires happening now. There is a very surreal quality to such an experience. Sometimes it is easy to forget how quickly life can change and that we are not in control of all aspects of life. I am hoping that the weather will bring rain (no lightning!!) and for the winds to die down so that these fires can be contained and no further losses are incurred. Counting down the last three blocks in The Sewcial Bee Sampler (a fun online sew along), hosted by Sharon Holland and Maureen Cracknell! The block for this week is Friendship Star. (for the free download to make this or the previous blocks, visit Maureen's or Sharon's blog). This week's block was one of the simpler ones to make and for my version I decided to reverse placement of background (in my case, the low volume fabrics) and the main colour. This allowed for some fun fussy cutting of a wee owl for the center of my block, as a focal point in the design. It was a complete accident that my owl looks like he has a tuft of feathers on his head, thanks to the print used above him, but I love the results! Since this block finishes so small, I decided that I would select low volume fabrics that contain lots of yellow to use for the borders, in hopes to keep this simple block from looking undersized next to the others in this sampler. If you've been following me along this sampler making journey, you know that this is my second yellow block in my rainbow, scrappy version! Any guesses for the colour(s) for next week's block? I can't sing the praises of this sew along enough! 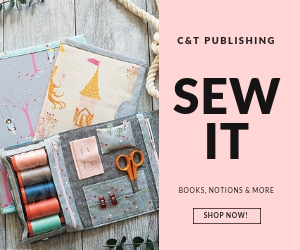 Please visit Maureen's blog and Sharon's blog for all the details in joining this fun, sew-at-your-own-pace, virtual sew along! 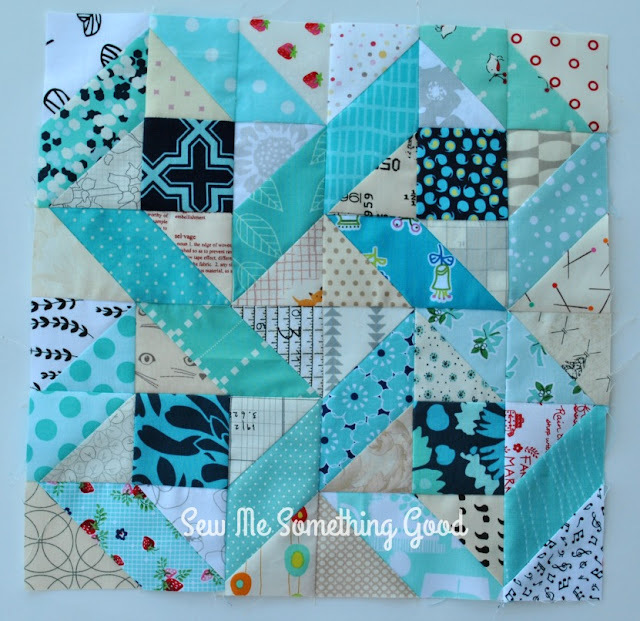 It doesn't matter if you're new to quilting or if you're experienced - this sew along is geared to be fun and manageable for all skill levels. The best part is the community of support you will be a part of! It's unbelievable - truly makes it so enjoyable! If you're on Instagram, you can find all the inspiring blocks that are being made shared under the tag #sewcialbeesampler - although I will warn you, it will be difficult to resist joining in, once you see so many beautiful versions. Time is flying and the countdown is on for the completion of the last row of blocks to be released in The Sewcial Bee Sampler (a fun online sew along), hosted by Sharon Holland and Maureen Cracknell. The block for this week is Mosaic. (for the free download to make this or the previous blocks, visit Maureen's or Sharon's blog). 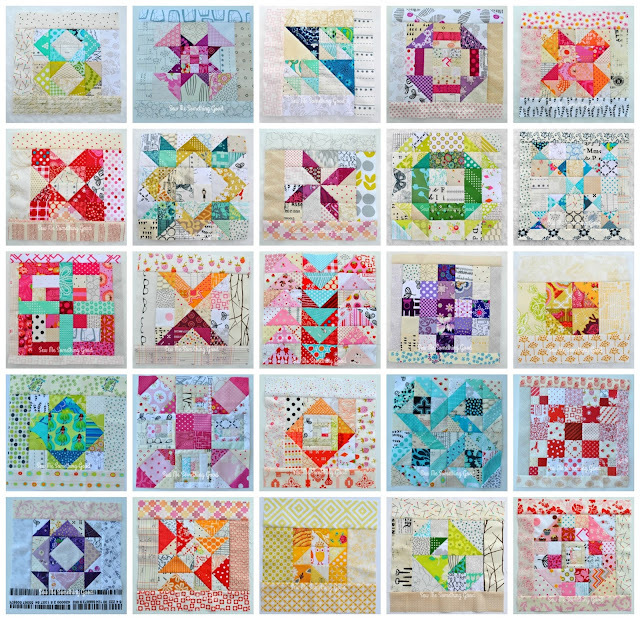 Here's a look at the first 20 blocks in the sew along, which today's and last week's block will be joining. My vision for a scrappy rainbow sampler is coming together quite nicely and I am super excited that there's only three blocks left to make before I can start joining them together with sashing. Another week has zipped by! Time for the next block to be released in The Sewcial Bee Sampler (a fun online sew along), hosted by Sharon Holland and Maureen Cracknell. The block for this week is an Hourglass. (for the free download to make this or the previous blocks, visit Maureen's or Sharon's blog). 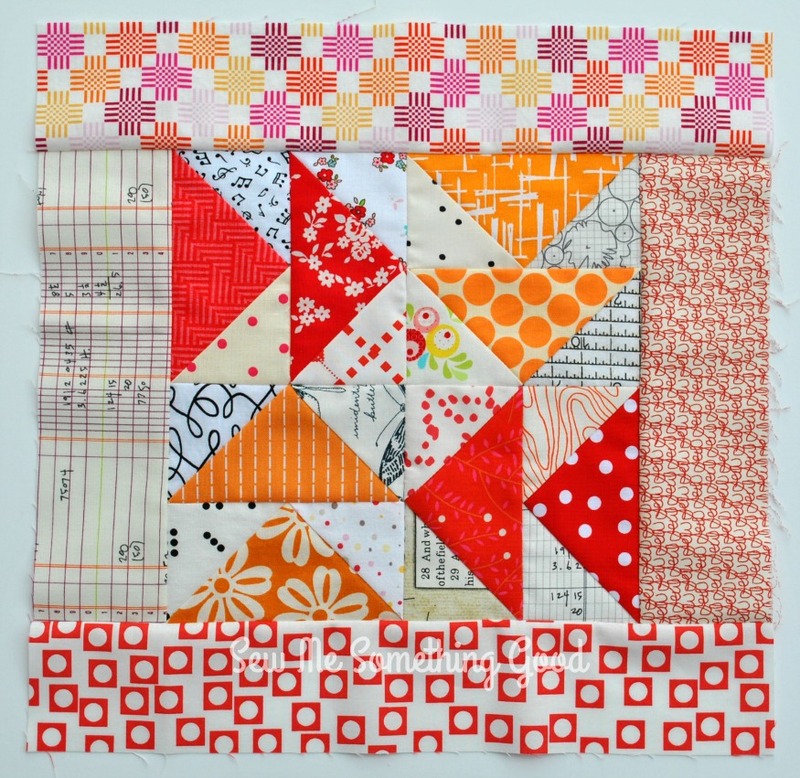 If you're following along, you know that my plan for this sew along is to make blocks using my scraps and to make the overall colour theme for this quilt, a rainbow. So far, so good! 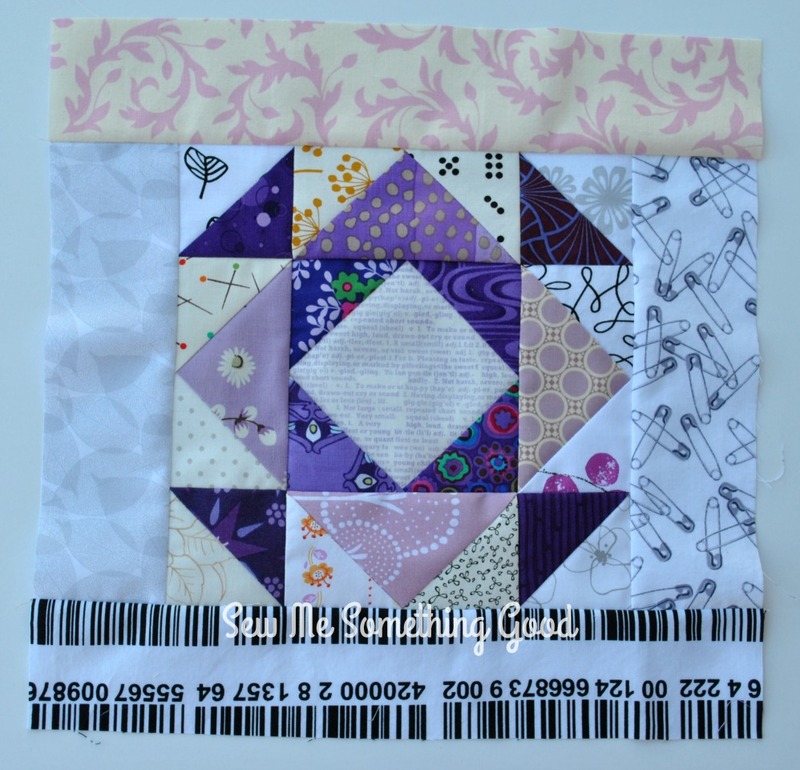 This block will be the second one to use the colour purple and considering that this is not a popular colour in my stash, my block was made mostly from fabrics that I have received in swaps over the years. It feels like an achievement that I found enough purple fabrics to make this block happen! 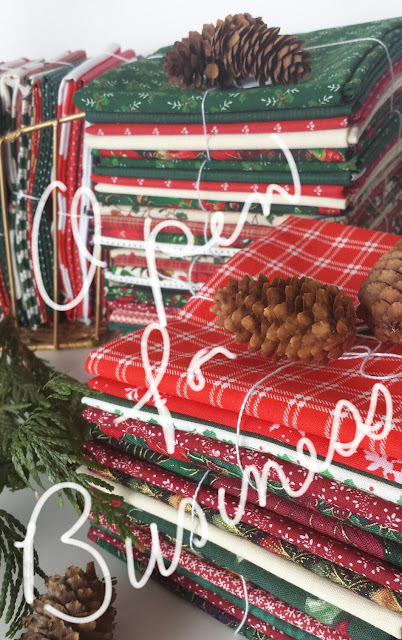 Pop over to Maureen's blog and Sharon's blog for all the details in joining this fun, sew-at-your-own-pace, virtual sew along! 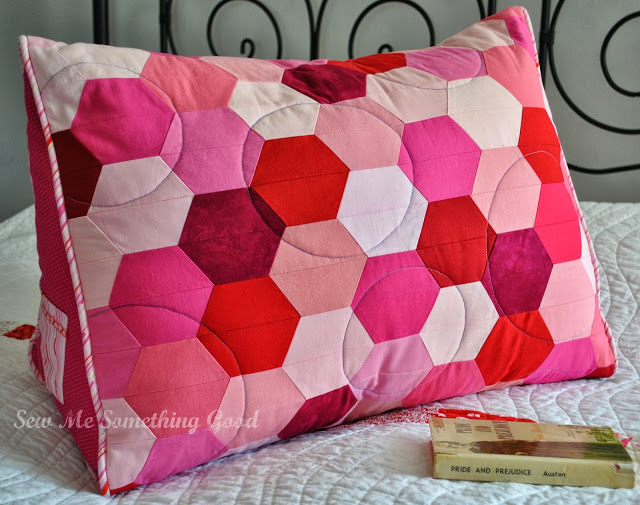 It doesn't matter if you're new to quilting or if you're experienced - this sew along is geared to be fun and manageable for all skill levels. The best part is the community of support you will be a part of! It's unbelievable - truly makes it so enjoyable! If you're on Instagram, you can find all the inspiring blocks that are being made shared under the tag #sewcialbeesampler - although I will warn you, it will be difficult to resist joining in, once you see so many beautiful versions. Today, I’m excited to be able to share one of Free Spirit Fabrics’ newest lines, Shades of Rose, by one of my favourite designers, Tanya Whelan! Please, pop over to the Free Spirit blog for the Artist UnSEWn series and more. 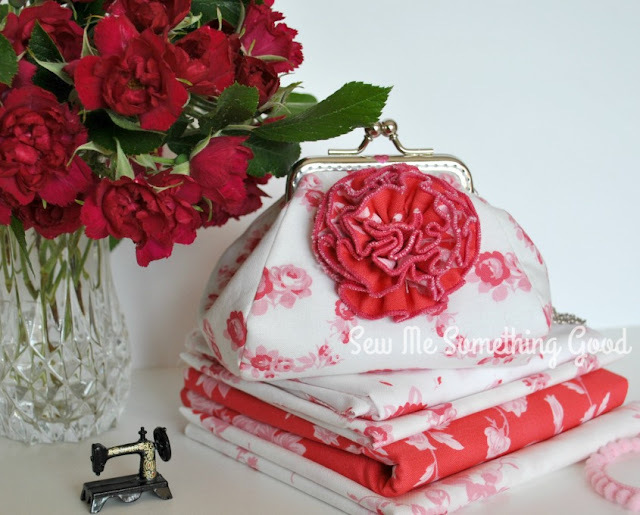 Shades of Rose is now available to purchase, but I was lucky enough to receive some yardage in advance, so that I could do some secret sewing with it. ;o) What a pleasure to be sewing with these gorgeous, romantic fabrics! I love the vintage, yet modern feel to Tanya's designs. Shades of Rose is soft and feminine with a shabby chic flair to it, which I love. A great line to start with, if you're new to Tanya's designs, as well as being a great line to add to her other collections. 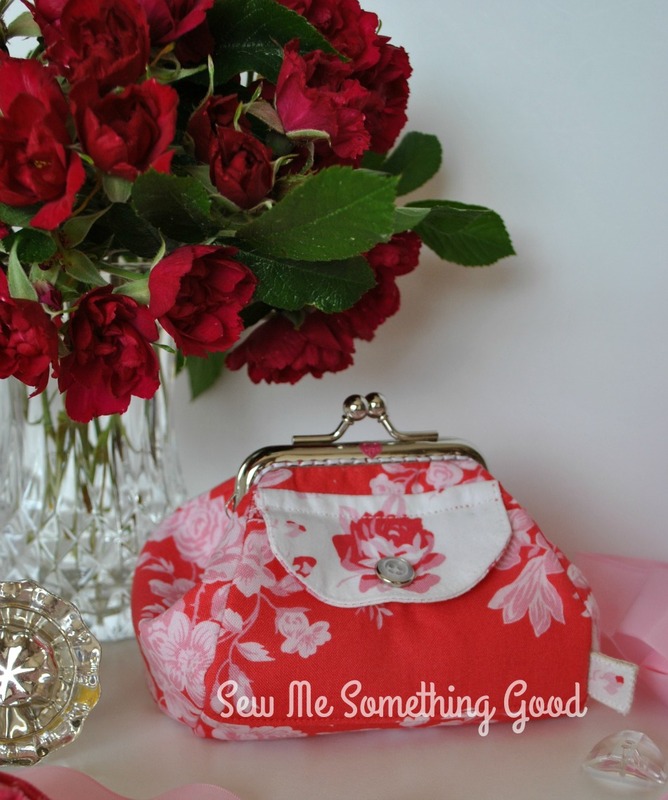 I selected four fabrics from the red colour way to sew up a few projects of my own design. 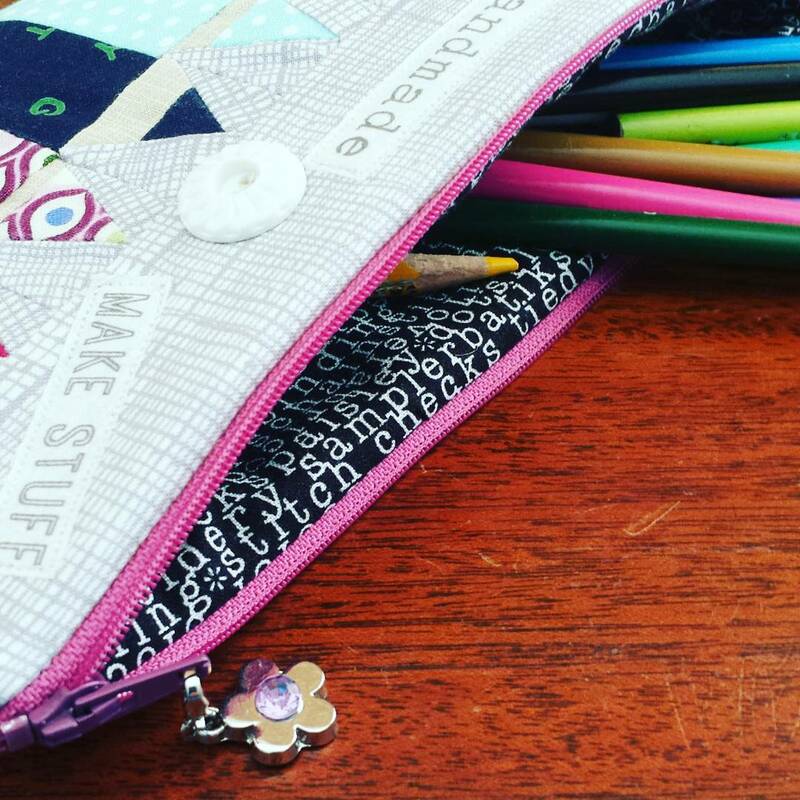 My kiss clasp coin purse design is compact, yet roomy - it will hold more than just coins! The fabric rose on the front is fastened by a brooch pin, so it is removeable. Shades of Rose seemed like the perfect fabric to debut a couple of coin purses that I designed several years ago (and always intended to turn into a pattern). My first coin purse with the attached fabric rose brooch, has Trellis for the exterior and Falling Rose for the interior. The fabric used to make the brooch is Toile. 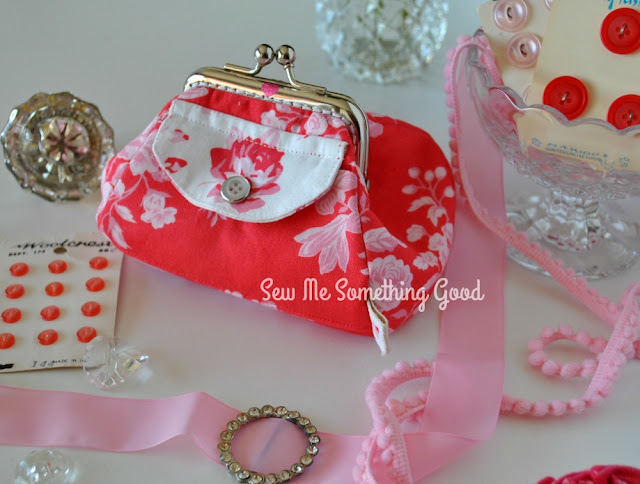 The coin purse with the pocket, has the exterior made from Toile with Trellis for the interior, while the pocket flap is fussy cut from Falling Rose. I couldn't resist sewing up my favourite gift bag design using Shades of Rose and adding a couple of extra details to it. Perfect for tucking a gift or two into! The drawstring bag features Wild Rose and Toile for the exterior and Trellis for the interior. I used some fussy cuts from Falling Rose and Trellis combined with scraps of linen and twill tape to make two different "tags" for a special detail. The rose prints work so well for fussy cutting! Speaking of fussy cutting... I didn't stop with making tags for the gift bag! I also made some individual gift tags featuring fussy cut roses stitched onto canvas and then backed the canvas with more Shades of Rose (**I used my tag die in my Sizzix Big Shot to cut them out of canvas & fabric which allows me to make multiples quickly and easily. However, you could draw or trace a tag shape you like and then you can cut tags by hand). For gift giving, I can either stitch or stamp the recipients name onto the tag - or more often, I use either a fabric pen (which is permanent) or a Frixion pen (which is removeable when heated by iron - just be aware that ink will reappear if subjected to below freezing temperatures ;o). 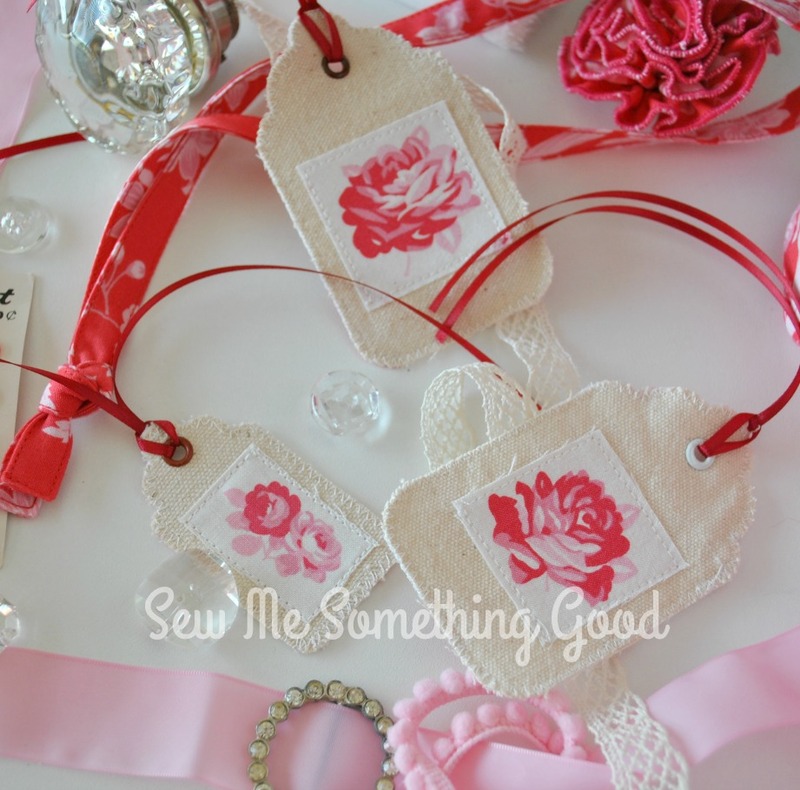 Simple gift tags made from fussy cuts stitched to canvas and backed with interfaced Shades of Rose. The final simple project I made were sweet notecards, that use scraps of Shades of Rose along with assorted haberdashery (scraps of lace, ribbons and odd buttons work wonderfully for this!). 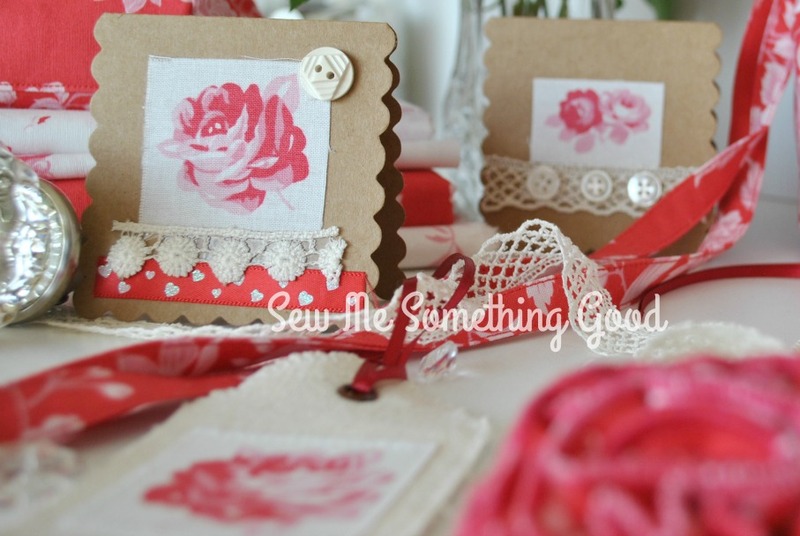 Notecards made from scraps can be stitched onto the card or as in this case, secured using double sided tape. I had the most fun creating with Shades of Rose and I hope you will find some inspiration in what I've shared today. 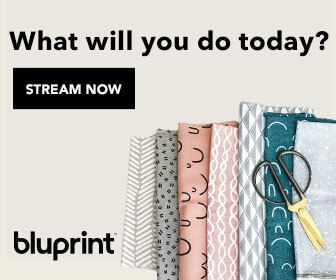 Be sure to check out the Grey and the Turquoise fabrics in the Shades of Rose collection (there are six prints in each of the three colour ways). GIVEAWAY: update: winner is Marta! Congratulations! 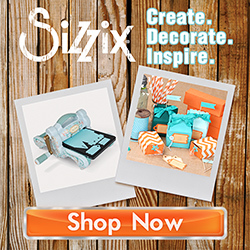 I know you will enjoy creating with Shades of Rose! Comment below for a chance to WIN a bundle of Tanya Whelan's Shades of Rose fabrics (the ones that I used in my projects) from Free Spirit Fabrics! Contest will run through 6pm PST on June 23, 2017 and is open worldwide. 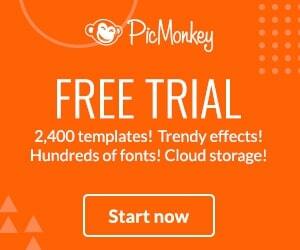 One entry/comment per person, please. Winner will be contacted via email (please, leave your email in your comment) and will have 48 hours to claim their prize. 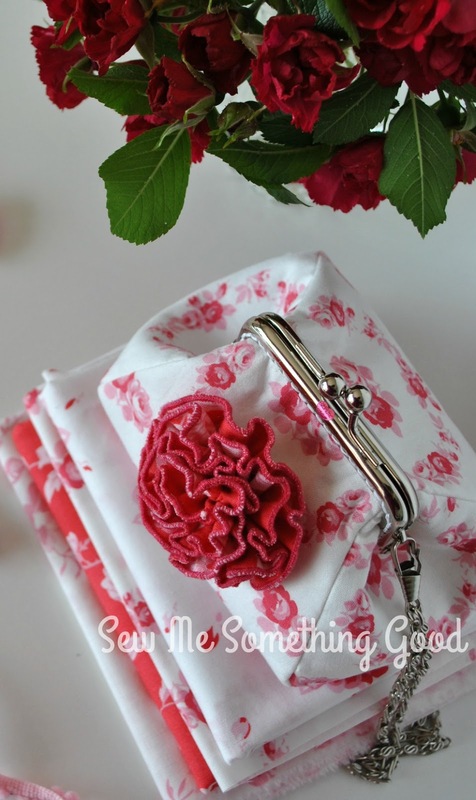 The giveaway and the fabrics used in this post are both sponsored by the friendly folks at Free Spirit Fabrics! Thank you so much for visiting and special thanks to Free Spirit Fabrics! Time for the next block to be released in The Sewcial Bee Sampler (a fun online sew along), hosted by Sharon Holland and Maureen Cracknell. The block for this week is an Irish Chain Variation. (for the free download to make this or the previous blocks, visit Maureen's or Sharon's blog). This block would make a wonderful quilt all on its own! I couldn't resist making a mock up using the collage option of PicMonkey to see how this would look. Woohoo! That's the fourth row complete in our quilt top - only five more blocks to finish and then it will be time to add sashing strips. Getting really excited to be nearing the finish! 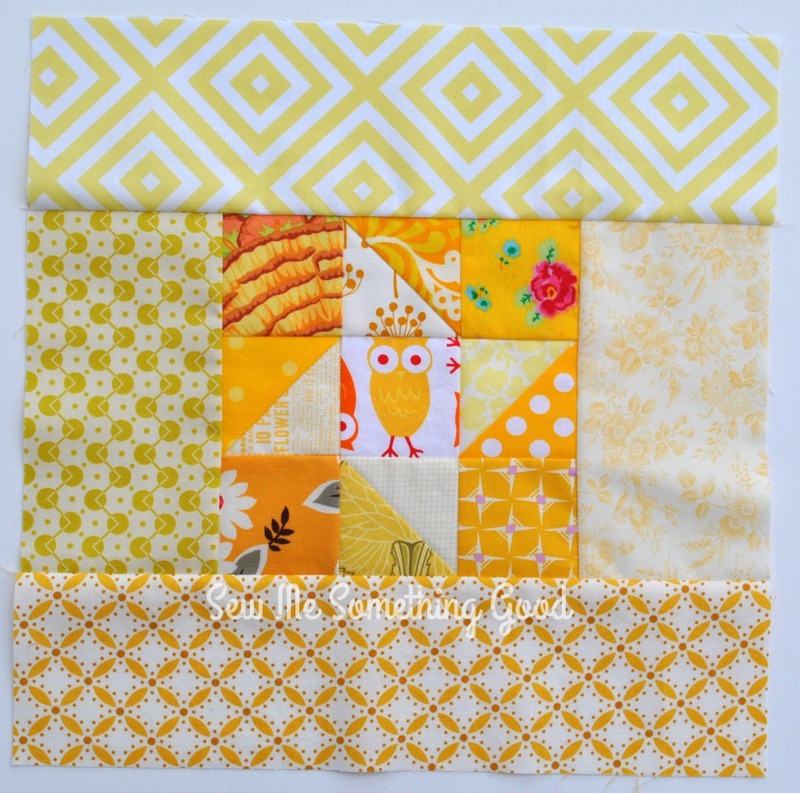 Another week has flown by and it's time for the next block in the Sewcial Bee Sampler sew along! 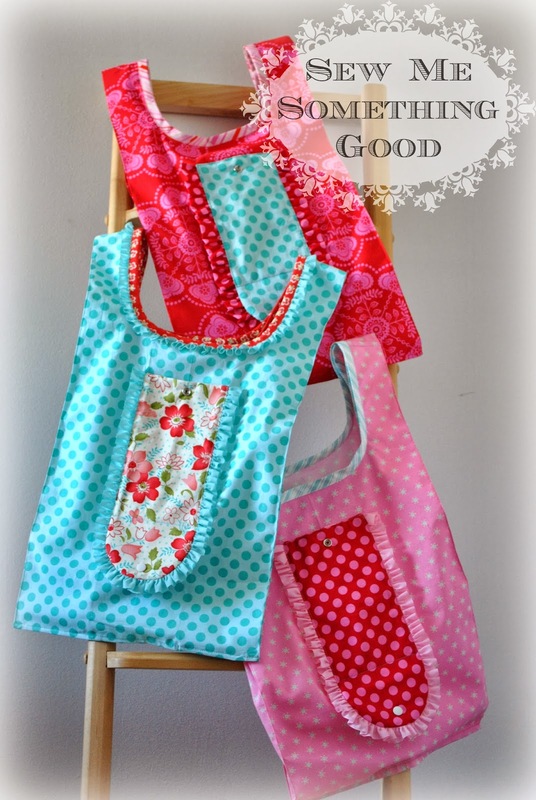 This fun online sew along is hosted by Sharon Holland and Maureen Cracknell. The block for this week is Circle of Friends. (Please visit Maureen's or Sharon's blog for the free download to make this or the previous blocks). My favourite blues were selected to make this fantastic block! Digging through my scrap bins, it was fun discovering how popular aqua has been with me and how similar in value many of these fabrics are. I gave Block 19 a minor alteration from the original design. I decided to eliminate half square triangles (HST) as much as I could to give unbroken sections of my aqua scraps. Dividing this block into quadrants you will notice that there is only two HST units per quadrant (which means I reduced seams needed to construct each quadrant by three ;o). It made sense for me to do this since I'm making my blocks from scraps - this change even allowed me to use larger scraps, and I love the results! 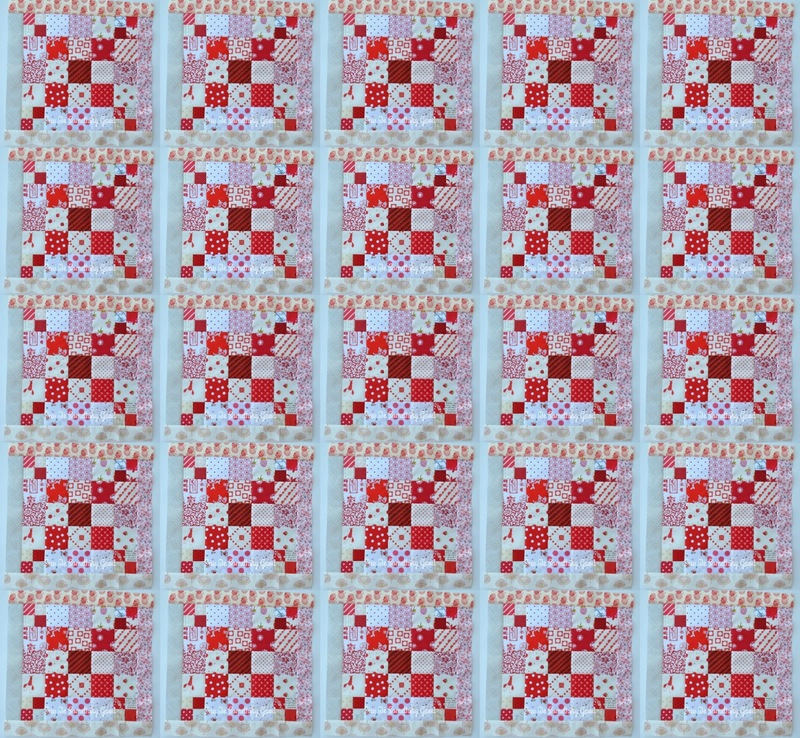 I could easily see this block being used to make a whole quilt, wouldn't it look fabulous? Wow! 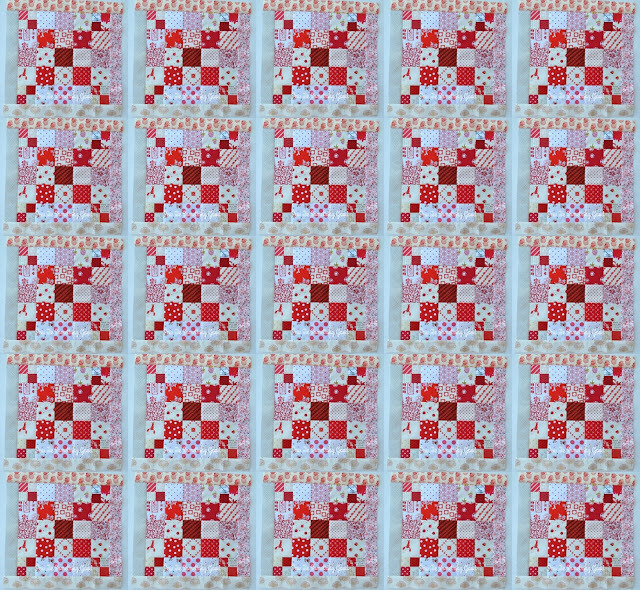 One more block and we will have finished the fourth row of blocks in the quilt - with only one more row to sew. I can hardly wait! Hopefully my mosaic making will help guide me in choosing colours for the remaining blocks. 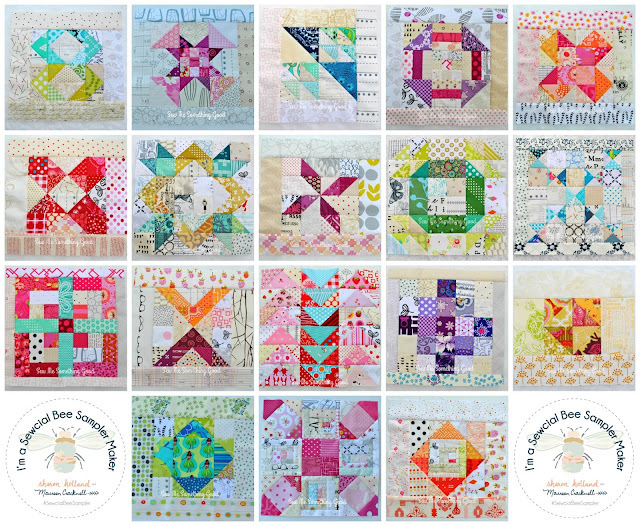 The Sewcial Bee Sampler sew along, is now at 18 out of 25 blocks! 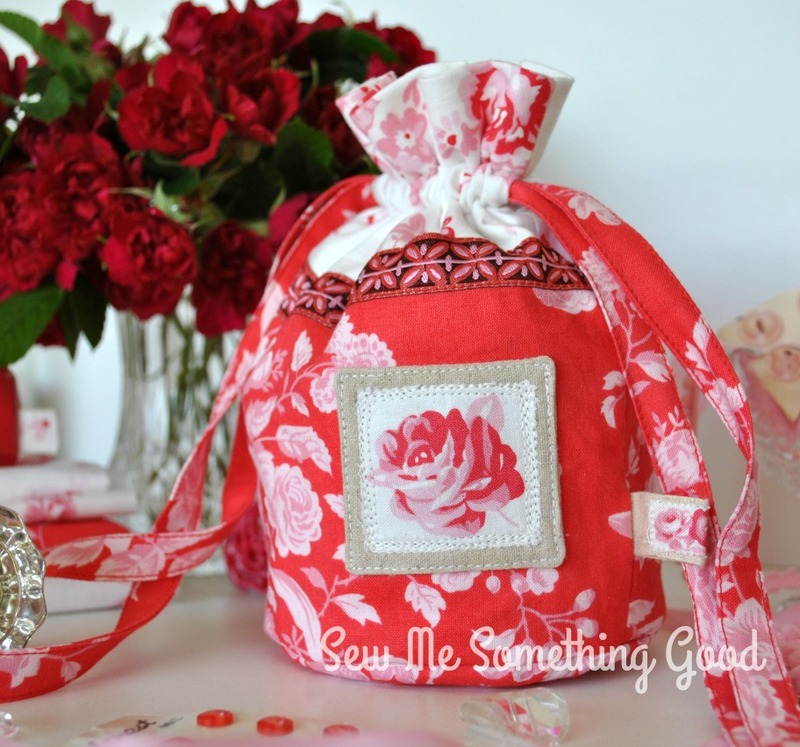 This fun online sew along is hosted by Sharon Holland and Maureen Cracknell. The block for this week is Square Peg. (for the free download to make this or the previous blocks, visit Maureen's or Sharon's blog). It has been my goal with my version of the sampler blocks, to use scraps and to mix colours of the rainbow with low volume fabrics. I am eighteen blocks in on this quilt and still having fun searching through my scrap bins for fun colours and treasured bits to make each block. I love scrappy quilts! I ended up making a couple more changes once I finished sewing my block (you can see my first version of block 18 shown in photo below, while the final version is in the photo above). I decided to replace a couple of my fabrics for the border when I realized I had mixed up placement of the long and short sections. Ooops! While unpicking the borders, I remembered that I had the key print ( Sandi Henderson print from her Secret Garden fabric line) in another colour way and that it would perfectly compliment the fabrics in my block. I couldn't help but exchange the border fabrics once I discovered that! I'm even more pleased with the second version. You may also notice that just like block 17, I couldn't resist making a pieced square from my low volume fabric scraps. I like that it adds a little more interest to the block and gives me the opportunity to use up a few more of my tiny scraps.